Integrative Functional Medicine is an evolution in the practice of medicine which addresses the health care needs of the 21st century. By shifting the focus of medical practice to a patient-centered system, Integrative Functional Medicine offers a personalized, whole person approach which addresses the causes of your illness, not just the symptoms. Do you have a family history with diseases such as: heart disease, diabetes, cancer or arthritis? Is losing weight difficult, but gaining seems unavoidable? Does your doctor say "everything's OK" but you still feel lousy? Are you taking supplements, but feel they're not working? If you answered yes to any of these questions, Integrative Functional Medicine can help you. Start treating the causes of your illnesses rather than just the symptoms. Prevent illnesses instead of spending time, money, and heartache treating them. 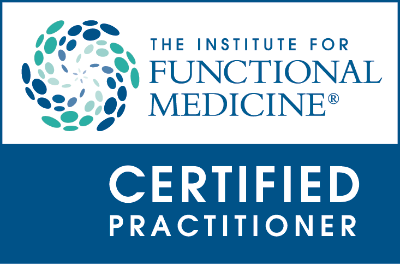 Functional Medicine is a science-based practice that emphasizes the interconnections of physical and biochemical processes in the body, and how they interact with the environment to create disease or health. It identifies the causes of your symptoms by trying to find their triggers. When we understand how your unique genetic makeup interacts with your environment, we can change how the genes are being expressed (behave) by changing their environment. Using a Functional Medicine approach has helped many of our patients find answers to complex, chronic conditions. Acupuncture is a natural method of encouraging the body to promote healing and improve functioning. Needling specific acupuncture points stimulates the nervous system to release chemicals in the muscles, spinal cord, and brain. The supplements I recommend and provide to our patients follow the high quality manufacturing practices, are third-party tested, are scientifically-based and free of preservatives, fillers, binders, coloring agents, gluten, yeast, lactose, etc. Functional neurology applies the latest in neuroscience research to address various nervous system disorders using a drug-free, non-invasive approach in an office setting. Genetic testing is the most advanced method of determining your ability to make and use enzymes that are critical components of your health. It is an effective way to determine how you to use diet and dietary supplements to optimize your health. I integrate evidence-based dietary, nutritional and botanical therapies with conventional oncologic care. Having been trained in Integrative Functional Medicine, I understand the importance of listening to your story, evaluating, and determining what genetic, environmental, and lifestyle factors are effecting your immediate and long-term health. Traditional Oriental Medicine is an ancient system that treats the body, soul, and, mind as one integrated organism. IGNITE'S ketones combined with the natural metabolites of caffeine and glucuronolactone, will give you that mental lift and performance that people report as "my brain fog was suddenly lifted."